(MENAFN - Jordan Times) AMMAN — HRH Princess Basma on Saturday inaugurated a Centre for Development employment office specialising in tourism and hotels in Aqaba, as part of an employment programme implemented by the Jordanian Hashemite Fund for Human Development (JOHUD). 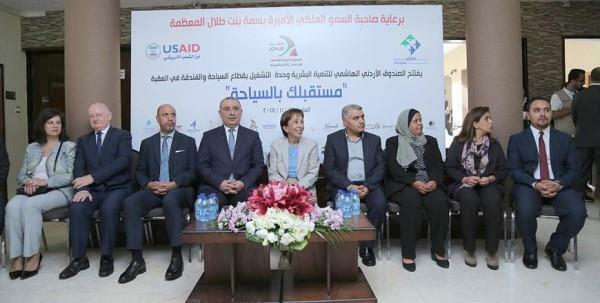 The office was opened through support from a USAID-funded tourism project to enhance economic sustainability in Jordan, through a partnership between JOHUD and the Aqaba Special Economic Zone Authority (ASEZA), the Jordan News Agency, Petra, reported. The office was inaugurated in light of expectations of an increase in jobs in Aqaba's tourism and hotel sectors, and the need for the Kingdom's tourism sector to provide some 10,000 jobs by 2020. HRH Princess Basma, during the inauguration ceremony, highlighted the importance of such partnership models to enable the youth to access the labour market. The princess, in the presence of ASEZA Chief Commissioner Nasser Shraideh, called on youth to explore working at hotels to improve the living conditions of themselves and their families. ASEZA Tourism Commissioner Sharahbeel Madi outlined the authority's efforts to provide attractive investment environments in various sectors, including the tourism sector, and increase the number of scholarships for Aqaba's residents in tourism professions. Joseph Ruddy, a representative of the tourism project at USAID, underlined plans for the coastal city, which are supposed to provide some 4,000 jobs by 2020 and link Aqaba to new air routes with several European countries. The newly-opened office aims at training and building the capabilities of jobseekers and connecting them with the labour market. It is also meant to help introduce entrepreneurs to financial institutions and contribute to combating social and cultural challenges which keep youth from working in the tourism sector.